Exemplary track record of delivering high quality and stable software applications. 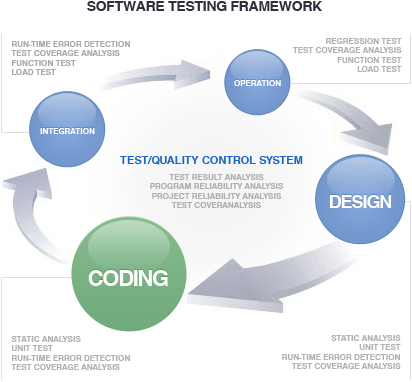 Software testing is a technique for testing and verifying the quality and performance of an application or product that is being developed. The process is regarded highly rewarding in determining whether the whole development process was a success or a failure by comparing the functionalities and features of the product with those mentioned in the client’s requirements. Besides, it also verifies the actual application feasibility of the developed solution together with all its characteristics. KADA technologies has 100+ highly skilled and experienced software testing engineers devoted to error free deployment of our software testing services. KADA treads on Agile development methodologies and Rational Unified Process practices in its testing services to supply highest quality of software solutions to our customers in the shortest time possible. However, an extensive discussion with client is conducted before the testing starts to notify client of all the options he has while focusing on advantages and disadvantages of each. KADA has more than 7 years of experience in software development and testing with an exemplary track record of providing highly robust and business centric software solutions to more than 100 clients, including fortune 1000 clients in the world. KADA has faith in realizing full client satisfaction in each and every engagement with its clients and try its best to achieve it. Our customers have always been more than appreciative of our software development and testing services and have adorned us with highly complementary testimonials.